4k TV as PC monitor.........is awesome. Discussion in 'PC' started by bluerover, Aug 26, 2018. Are you using a TV as a monitor? Sapphire Nitro+ RX 580 O.C. So, when making a decision on the monitor, I didn't wanna spend 500+ bucks for a 1440p monitor. I checked RTINGS.COM for TV suggestions. They have a rating category for using a TV as a monitor and TCL S405 model happens to be the best (for cheap) while delivering Chroma 4:4:4 uncompressed video. Best decision I've made in a long time. Put the build together (which posted on first try, thank god...), hooked up TV to 2.0 HDMI, installed driver. Running 3840 x 2160. It's crisp, fast, and beautiful. Use the quick Windows scale display slider to make everything bigger by 25% increments if you need it. I'll make an update when I start ......(*barf*) installing .....and working with plugs and audio. If you're on the fence about which TV to use, it's that TCL S405 - 43", 49", or 55". 49" is $299 right now. I use a (2K) 32" LG TV. Damn good display imo. I've been thinking about that for some time... When I get a 4K-compatible video card I'll borrow my Samsung 4K 50" TV set for a while to make some tests, and I guess that will make buy a a 4K TV for my PC... Thanks for the detailed comments!!! No problem. This TV is a very nice change. I got a lovely 43" sony 4k a couple of weeks ago when amazon had a deal on them, got nearly £300 off the retail of £850. I was worried that i would need a new graphics card but my old gtx970 runs everything at 3840x2160. Only game i play is world of warcraft and that runs fine. With win 10 and %200 scaling i can even use reason 10 at last, i could hardly ever read any text on it before. Best improvement for my computers since ssd's, lol. Be careful which one you buy if you'll sit close to it. A 28inch LED needs a healthy viewing distance of approximately 1.5m. While we take care of our ears, we might consider to take care of our eyes as well? Meaning, don't go for a bigger screen, unless your sweetspot is at the other side of the room. The bigger the screen, the more light it emits. Bear in mind that blue light creates bags under our eyes and causes sleep problems due to a decrease of melatonin production. So I rather use a screen with an optimal inch to viewing distance ratio. IPS technology, viewing angle, % of sRGB (has to be close or equal to 100%), ev. eye care tech, blue light filter, means for professional calibration, contrast, resp. time,.. I'm not going anywhere above 27" (tried bigger ones and at the given distance my eyes have to do more work.. so I get tired faster), so I am also thinking not to get up to 4K (yet). The rest of the build is more or less just what I'd take. But, as you get older you start to appreciate the quality of interface between you and the machine, lol.. The person next to me is basking in the glory of a 53" LG flatscreen t.v. bolted to the wall above her Alienware Aurora R4 gaming rig. She's well-happy with it performing as her pc display unit. I'd go for one except for that fact that I need a rock solid color reference monitor for digital artwork and video grading. Otherwise, yeah. No problem. @huschiwuschi That looks awesome, but wouldn't the 27" screen make everything reallllllly small at the max resolution? Especially for vst fx and vsti plugins that don't support DPI scaling. I was thinking to rent a movie theatre & connect my computer. So in the end you will have 2560x1440 on a 27" Screen BUT with double density which sould look awesome crisp. 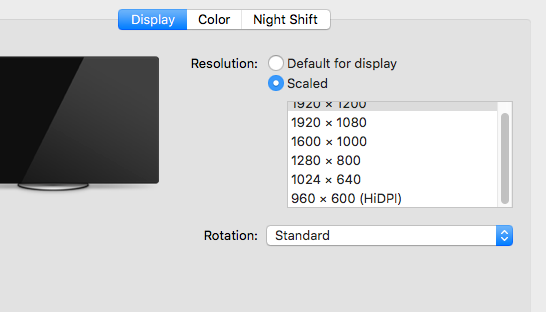 technically, an iPad is way crisper, even a 27" 5k is not as crisp. i'm still trying to find whats the catch on that TV, it really seems "too good to be true". but cannot find it, awesome product. The specs say Panel Resolution 3840 x 2160 ?